A car would, at first thought, seem an unlikely hazard for a marine mammal. In our desire for access to the once rugged, wild places near the ocean, we have made a formidable foe of our vehicles for some of the sea-going mammals that spend time on the shore. Sea lions, elephant seals, and yes, a much-loved sea otter, have met their death in encounters with vehicles. 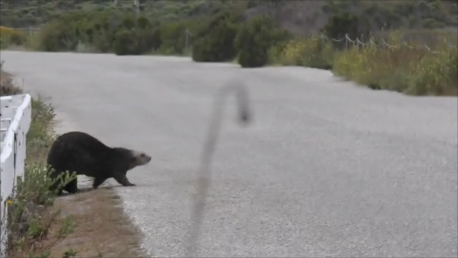 Why did the sea otter cross the road? The answer to this iconic children's riddle, "To get to the other side" is the truth, in part. A sea otter might cross the road to get to the other side, where some needed resource—prey, mates, a safe place to rest—beckons with enough urgency to draw a heavy weasel, built for a life in the sea, to find its land legs. In the coastal town of Moss Landing, California, there are two places where sea otters are known to venture onto and across paved roads to travel between resources. At both locations, sea otters are able to cross from one side to the other via man-made tidal culverts that pass beneath the roadway, but some circumstances---very low tides, rushing currents, or the tide-regulated closure of culvert gates---may force the otter to resort to crossing the road to return to a resting spot or to get access to a foraging area. Sea otter foraging on clams in Moro-Cojo Slough Along a narrow section of Jetty Road near the entrance to Moss Landing State Beach, sea otters have long been observed crossing between the north harbor and the neighboring Bennett Slough, where a small number find habitat for foraging and resting. 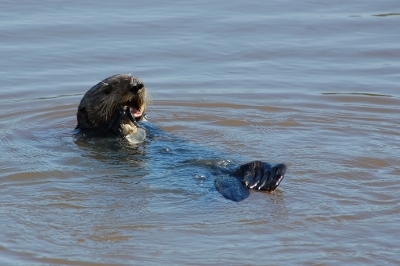 Opportunistic observations by sea otter biologists indicate that during ebb tides, when the current is too strong for a sea otter to swim successfully against it through the culverts, and low tides, when the culverts contain little or no water, a sea otter may cross on the road, where they are at risk of being struck by passing vehicles. There is also evidence that they cross during high, or even King Tide conditions, so it is clear more research is needed to better understand road crossing behavior. This uncertainty need not preclude action. 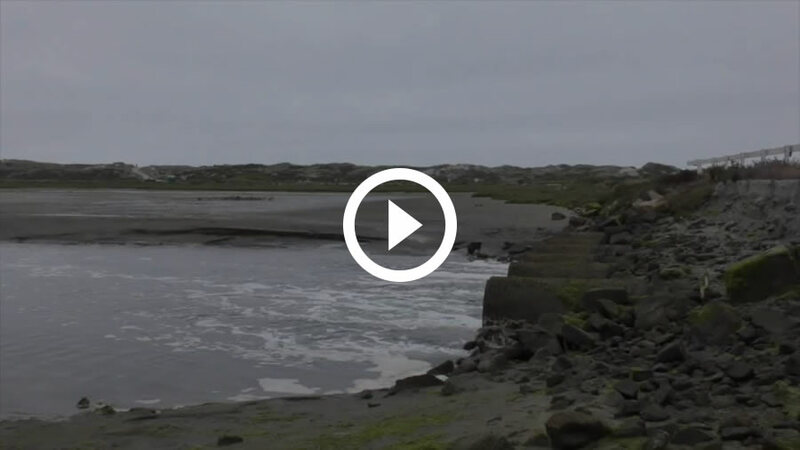 Recently sea otter researcher Natalie Uomini captured footage of a sea otter crossing Jetty Road. This dramatic video underscores how a split second may mean the difference between a dead or injured sea otter and one safely at home in the slough. Slow and vigilant driving is essential for preventing a tragedy. Sea otter crossing sign at Jetty Road in Moss LandingIn July of 2016, a male sea otter famous for making his home in the south harbor of Moss Landing, near the popular Whole Enchilada restaurant, was struck and killed on Moss Landing Road by a vehicle. He had been returning to the harbor after a nighttime foraging bout in Moro-Cojo Slough. The tragic death of "Mr. Enchilada" prompted management authorities and the local community to come together to take steps to prevent a reoccurrence. 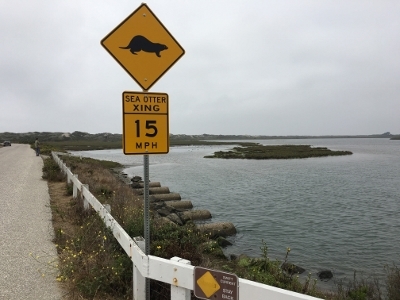 Monterey County Public Works instituted a speed limit reduction at the Moss Landing Road crossing and placed signs warning drivers of sea otter crossing activity. They were the first traffic signs of their kind, and the image of a walking sea otter had to be custom-designed. A few months later, in response to concerns that traffic had been little slowed by the signs, Public Works installed a well-marked speed table. The worldwide first of a sea otter crosswalk attracted media interest and garnered praise for Public Works. 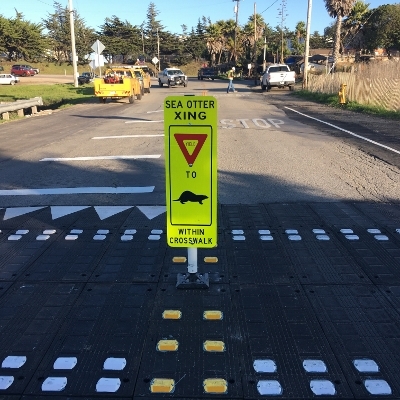 The Jetty Road crossing, which is under the jurisdiction of California State Parks, is now also marked by signs, and additional measures to reduce vehicle speed and increase awareness of sea otter crossing activity are in the planning stages. We have dissected so many wild places with our roads, with little consideration for the less visible trails and pathways made by our non-human neighbors. In the case of sea otters, warning drivers and slowing the vehicles on the road surface seem like a minimum first step. The best solution would be to keep them off the roadways entirely by making space for travel corridors beneath. This next step will require research on sea otter crossing behavior, well-informed design, public will, and significant funding—but considering the ecological and financial rewards that sea otters bring to our communities, isn’t it only right that we help sea otters find safe passage through our road infrastructure as they travel their own pathways to the places where they forage and rest?